Hopefully everyone had an enjoyable Valentine's Day? I did -- Dave sent me on a scavenger hunt around the house finding one clue after another. The clues were tied into some pretty cryptic things about our marriage, such as "When we were stationed in Louisiana we learned to put this on all our food" and there was the next clue taped to the bottom of my can of Tony Chachere's seasoning! Ultimately it led me to my old college backpack with a pair of pretty sapphire earrings inside. I was NOT so creative with Dave this year. I did take a suggestion from a fellow-chocoholic friend, Lisa C., and found something called Guthrie's "Sin in a Tin" at our local Publix grocery store. I was drawn to it because it's locally made, and we're all about the local fare! The cool 19th Century-styled tin is recyclable! It's marketed as a "chocolate pate", but you could imagine it as a giant chocolate truffle! It's sold frozen, but if you bring it to room temperature, you could spread it. Spread it on what? I don't know -- on what do you spread chocolate? A cracker? A chocolate cookie? Oh wait, read the directions for suggestions! It's made right here in Pensacola! We simply sliced it and made it dessert for Dave, Timmy and me for two days. Yum! 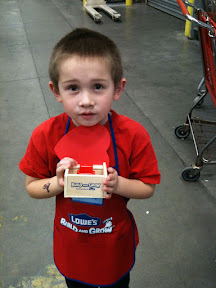 We enjoyed a special Valentine's Day-themed Build and Grow project at Lowe's last Saturday! They had asked for them for Christmas, but I'm glad we waited till now, I think that Valentine Puppy sure is cute! I'd backed off significant gifts for Valentine's Day over the past couple years, but I'd kept these Pillow Pets in the back of my mind this year. They're about $20 each. I found the Valentine's ones at Walgreen's. You wouldn't think of it, but you can whip together a pretty nice Valentine's Day experience at your local drugstore. I also found some M&Ms Star Wars gifts...$5 per kid. The lightsaber on the left in the bottom pic has LED lights, you press a button and it stays on for about a minute. More M&Ms stuffed into the handle of that toy.